The other day I was doing a bit of a review and I found that I have written and published over 210 blogs (plus a few I’ve written for other sites). I felt this was a pretty good achievement, given that my writing habit has been a bit patchy. The first one was published on 14 July 2011 (it was called “Designed to Fail”, since you ask), so that’s about 76 months ago. That means my average frequency of blogging has been about 2.8 blogs a month. Not bad, eh? Puts some of you to shame, I bet. 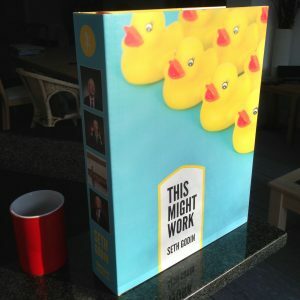 One of my inspirations to blog (the other being my mate Bernie Mitchell) is Seth Godin and as I checked my emails today I saw that his blog had arrived, entitled “This is post 7000”. As in, it’s the 7000th one he’s written. Rather puts my couple of hundred into the shade, doesn’t it. His blogging frequency is about 1.0 blogs a day. Yes, a day, because he blogs every single day and has done for, er, well, 7000 days. That’s over 19 years straight. To say it’s a lot of words is a bit of an understatement. The picture is the first of two large books he has produced that are a kind of ‘best of’ the blog. I bought this one when it came out and, yes, it really is that big. (You can buy a ‘normal’ size version too, which is a sort of ‘best of best of’). No, I have no idea why he did the big one but it’s a rather impressive edition, I have to say. So this tells us a few things. It shows that a small daily habit can have a massive impact (especially if you drop the book on your foot). It tells us that everything is relative (because 210 is not 7000 but it’s not nothing, right?). It tells us that comparison can be unhelpful (because, compared to Seth, I’ve hardly started and could decide to give up). But it also tells us that doing something is better than doing nothing, because it separates you from the majority and puts you in the company of some pretty amazing people, people who do their art. So go and do something creative and run with the cool kids.